It’s A Christmas Carol, right? And normally, I’d get comfortable on the couch, sipping homemade liquored-up eggnog, roasted chestnuts in hand, and lot’s of cookies, ready to weekend, movie-marathon all the film & television versions of Dickens’ annual holiday heart-string-puller. 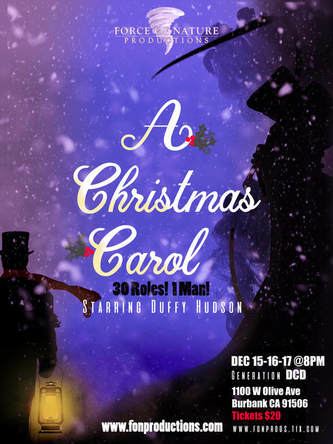 Except…this year, Force of Nature Productions in collaboration with actor, Duffy Hudson, has lined-up, one of the more zany presentations of this classic Christmas tale. One actor juggling 30 characters. It seems a little schizophrenic. And that’s part of the attraction I think. People come for a lot of reasons. To see the show mainly because they want the fun Christmas Carol experience. Because they love the story. Because, if I’m touring around, sometimes I’m the only game in town. I sometimes find myself in towns so small, I realize that half of the population is going to be at my show. Curiosity. The truth of the matter is, Dickens really did revitalize Christmas. He was a devout Christian who thought everybody were heathens. At that point, London was pretty secularized, maybe even more than it is now. Nobody did anything for Christmas. It was really pervasive. And he was kind of taken aback by that. At that time there were no intellectual property rights, and no way to make any money on your writing except to serialize storytelling, which is how he maximized his income. Everything was published in serial form, in magazines, which is why, when you read any of his work, these are very thick volumes. The more installments, the more he’d make. He could keep it going. Dickens would also tour around the world. He came to the U.S. twice and on both trips he met with Edgar Allan Poe. They talked about the intellectual property issue. They were both very big on trying to create something that could save them. Poe made only fourteen dollars for The Raven. Once it was printed it was free game. A Christmas Carol, is a little novella. But a big portion of it is big, beautiful descriptive stuff about the smell of the food, and the people. When you take out all the description from the story, you’ve really got a ninety minute show. How did the idea of a solo production take shape? 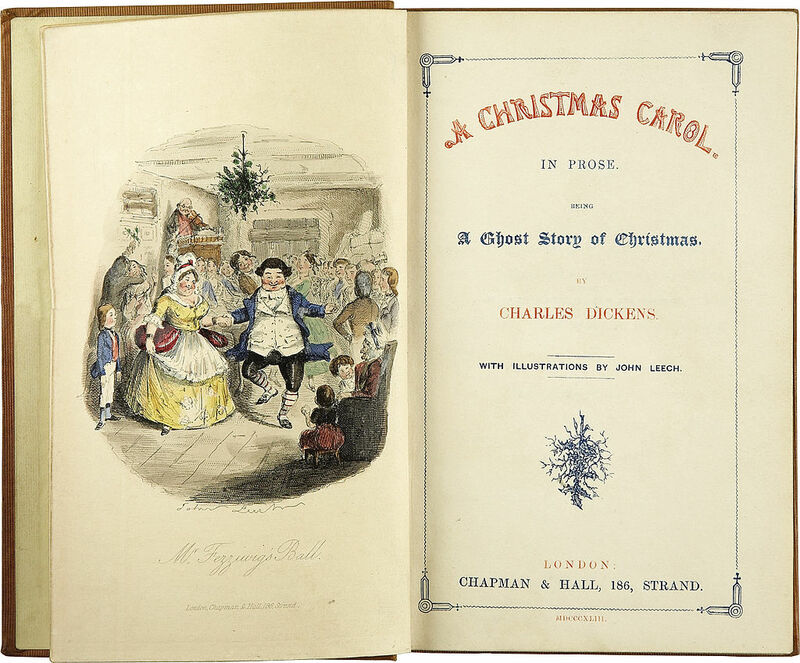 One of the things that everybody wanted from Dickens when he would come around and tour, is they would want to hear from the Christmas Carol. He would read sections from A Christmas Carol, and he got very adept at reading this story. So the precedent for doing it, almost as a one man show, was established by Dickens. I had been doing a lot of characters, and I wanted to do something for Christmas. Nothing comes to my mind except for A Christmas Carol. At first I thought, “Oh I’ll have a hat rack and all these hats and all these props”. But then the more you do it, the more it’s simple. No hats, no props, no nothing. It’s enough for your face to become another face and your voice to become a different voice. What I found, that almost came off as effortless, were the voices. It just became very easy. And the thing that I keep marveling at, is that Scrooge’s voice is the one that actually changes, from the beginning to the end and gradually in between, because he goes through a change. It’s the same voice, but it’s with such different intention. The other thing about Scrooge I always found interesting, is that, you know, when we talk about Scrooge, we say “Don’t be a Scrooge!” or “Oh he’s such a Scrooge!” We talk about the negative aspect of Scrooge. But Scrooge is a character who goes through this incredible metamorphosis and becomes this incredibly generous big hearted person. Nobody ever says, “Be a Scrooge!”, referring to be a big hearted generous person. Even at the very beginning, when he gets the first visit from the first ghost and he goes to the first place, he begins to come back. He sees himself as a child in the boarding school, he sits down and starts weeping. So he is totally redeemable from the beginning. What do you think redeems him? His sister. He loves his sister. In the book, there is some schism between Scrooge and his father and we don’t know what it is. We know that Scrooge’s father sent him off to boarding school, and was happy to raise his daughter; and that he was happy to leave Scrooge there for years. The mother is never mentioned. And then it’s the sister that talks the father into letting Scrooge come back home. And you know he totally appreciates that and loves her for it. Because she has unconditional love for him. There is something very pure about that love as a young person, even more pure I think than his love for Belle, the girl he totally blows off. That’s what it is I think. Not just all the cute parties and all the this and that. This man goes through a lot. He does a lot of soul-searching. It’s about seventy-five minutes. No props. I’m in all black. And I wear a red scarf. The literature and the beauty of the story stands for itself. That’s all you need.